First, it was the radio, then television and now the Internet, bringing news of the outside world into our homes. Wait. Cory, what is this? TURNER: That was pretty good, right? KAMENETZ: Is this - I thought this is LIFE KIT, the podcast. TURNER: That was my announcer voice. I'm doing an old newsreel. TURNER: We're talking about news in our homes, right? KAMENETZ: Oh, yes, yes, yes. OK. So we are. So, yes, we are all taking in news all the time - this crazy 24-hour news cycle. But what we don't always realize is that our children are often listening right alongside us and, sometimes, that's not so great. ALISON AUCOIN: I was really little during the Vietnam War. KAMENETZ: Alison Aucoin (ph) grew up in rural Louisiana. AUCOIN: My dad was in favor of the war and watching the news in the evening after work. WALTER CRONKITE: To say that we are closer to victory today is to believe, in the face of the evidence, the optimists who have been wrong in the past. AUCOIN: The way that our house was set up, it was sort of impossible for me to completely miss it. I was just disallowed from, like, sitting down in front of the television and watching. And I think that my mom thought that she was doing a better job of protecting me from it than she actually was. AUCOIN: So I would catch sort of glimpses of the film from Vietnam and, you know, just sort of words. TURNER: And one of those words confused and terrified her. UNIDENTIFIED REPORTER #2: Several hundred of the estimated 2,000 guerrillas are slain. UNIDENTIFIED REPORTER #3: The art of anti-guerrilla warfare. AUCOIN: I know I'm not the only one of my age group that had this happen, that - we heard the words guerrilla warfare and we thought gorillas, like apes. And I literally had a plan for where I would hide in my closet when the guerillas came. KAMENETZ: I'm Anya Kamenetz, an NPR reporter and the mother of two girls. TURNER: I'm Cory Turner, an NPR reporter and the father of two boys. And you're listening to LIFE KIT for parents with Sesame Workshop. KAMENETZ: We help you answer the really tough questions that kids can throw our way about things like death and race. TURNER: And in this episode - how can we talk to our kids about really scary stuff in the news? KAMENETZ: Yeah because, in our super-wired world, we just can't protect them from hearing everything. TURNER: We'll have that when we come back. KAMENETZ: So, Cory, my formative scary news event as a kid was the Challenger explosion. I was in kindergarten. And, you know, in my memory, it was live in my classroom. I can't find out for sure if that was true, but I remember all the buildup, all the excitement and then seeing that light just go off in the middle of the blue sky and having no idea what had just happened. What was your story? TURNER: I'm a little embarrassed by mine but, growing up in the Midwest, it was all about tornadoes in the spring and the summer. I just - I so vividly remember my dad always tuning in to the local news. And anytime the scarlet sky would get even remotely dark and after a tornado struck, again, it was, like, wall-to-wall local news on TV with pictures of the destruction and stories of how many dead. And I just remember feeling so powerless. KAMENETZ: I don't think it's embarrassing at all. I mean, I grew up with hurricanes, and it's just this power that you have no way of understanding. And so, for this episode, we also asked for your childhood memories of news events, and you'll hear them all the way through this episode, like Alison. Some are scary, and some are just really out there. TURNER: And, like we always do on LIFE KIT for parents, we reached out to our partners at Sesame Workshop. For this episode, we sat down with our old friend Rosemarie Truglio. She is Sesame's senior vice president of education and research. ROSEMARIE TRUGLIO: Listen, I've been working at Sesame for a long time now. But when I go to the set and Elmo talks to me, I talk to Elmo. He is real. KAMENETZ: We also got help from Tara Conley. She's a professor of communications and media at Montclair University. TARA CONLEY: I'm not a parent, full disclosure, but I am an auntie. TURNER: ...We've got six takeaways to help you and the little people in your life make sense of a world that can feel really overwhelming. KAMENETZ: Yeah. Takeaway No 1. TRUGLIO: We can't control the amount of information. We can control the amount of exposure. KAMENETZ: Rosemarie says, for starters, try not to let your kids watch or listen or browse the news without you. TURNER: And try not to stream it or leave it playing on the background all day long. MOLLY LEWIS: Because my parents had 24-hour news just kind of on around the house throughout the day, I absorbed more news as a child than I probably should have. KAMENETZ: Molly Lewis (ph) is one of the many folks who shared their story with us. She was 6 years old when the 1996 murder investigation of JonBenet Ramsey was getting wall-to-wall coverage. LEWIS: JonBenet Ramsey and I were pretty much exactly the same age. And I knew that murder was a thing, but I had assumed up to that point that murder was just a thing between adults. And, suddenly, I was learning that children could also be murdered. And what's worse - they could be murdered in their homes, potentially, by someone that they very much trusted. TURNER: Oh, my gosh. That is such a heavy thing for a 6-year-old. KAMENETZ: Absolutely. And, I mean - but it's going to happen if kids spend too much time with content that's not meant for them. And I remember, Cory, a couple of years ago, Common Sense Media reported that 42 percent of parents of young children say the television is on always or most of the time in their home, whether anyone's watching or not. TURNER: Wait. Wait - 42 percent? KAMENETZ: Yeah, yeah. Parents of kids under 8, right? Yeah. And without realizing, right? KAMENETZ: So it's pretty common. So I asked Rosemarie about this. So, concretely, should we not have news on in the background when our young - when our kids, young kids are around? TRUGLIO: I think that's probably a good rule of thumb because you can't control these breaking stories, which are always breaking. TURNER: So that's priority No. 1. But what if you did your best and your child still sees or overhears something on the playground or online? KAMENETZ: Yeah. I mean, you and I both know when your kids get a little older, you cannot control everything they see and hear. KAMENETZ: And so something's going to come up. It's going to upset them. They're going to have questions. TURNER: Yeah. And you're going to need to talk about it with them. TURNER: And that leads us to takeaway No. 2 - when you do have that conversation with your child about something they've seen or heard that scared them, you need to begin by asking them what they know. KAMENETZ: Tara Conley, the media researcher, says to choose a quiet moment when the phones are down, the TV's off, maybe on the way to school. CONLEY: Allowing them to have that space, where they're asking questions about what they're seeing, how they're feeling, what do they think - you know, who do they think the story is talking about? KAMENETZ: Basically giving kids the space to reflect. And she said this also gives them permission to bring up something that may really have been bothering them. TURNER: Also, asking what kids already know, it's really important first step because anybody who has kids knows that kids often will develop these wild misconceptions when they don't know the full story. And they have very little background knowledge and very little understanding of the wider world to help them here. KAMENETZ: Right, like Alison, who thought guerilla warfare involved, like, hairy apes, or this story from Emily Proka (ph) from Connecticut. EMILY PROKA: When the Monica Lewinsky scandal happened, I sincerely thought the whole thing was in the news because she got a stain on her dress. I was terrified that any stain I may get on my clothes would end up being the laughingstock of my middle school. And I still get an uneasy feeling when I'm at a party and spill anything on my dress. TURNER: I feel so badly for Emily. That sounds kind of terrible. KAMENETZ: I mean, kids' imaginations are something else. And, in some cases, what they make up can be even more upsetting than the truth. TURNER: Yeah. We have another example of this from Sarah Lindenbaum (ph). She grew up in the early 1990s in a small Illinois town. And she remembers seeing news footage of tanks and fighting from the war in Bosnia. SARAH LINDENBAUM: I remember huddling on the stairs, feeling very scared because I did not have a sense of the geographic boundaries of the conflict. And so, to me, the possibility that something like that might come to central Illinois seemed, you know, pretty high to me. And I was probably about 6 or 7 years old, but the fear that I felt sticks with me. KAMENETZ: So, Alison, you know, had the same misconception, too. And this is a really good moment to make the point that the bulk of the bad news that kids hear about - you know, it likely is not happening literally in their backyards. TURNER: Yeah. And so, in these cases, Rosemarie from Sesame - she has a really simple suggestion. TRUGLIO: You could get a map. You could, you know, you could see distance, that it's not in their immediate environment. TURNER: And this brings us to our next takeaway. When we're done asking questions to figure out what exactly kids do or don't know, give them facts and context. KAMENETZ: So when the Sandy Hook school shooting happened in 2012, Rosemarie's own son, Lucas, was in elementary school then. She didn't avoid the subject. She made it really clear with him that children were killed. TRUGLIO: I wanted him to see the faces of the children. I wanted him to understand what happened. KAMENETZ: But she also stayed calm. That's important. TURNER: Yeah. And she didn't overload him with a lot of information. TRUGLIO: Does he need to see all the gory details? No. Does he need to know of every event that's happening? Absolutely not. TURNER: Now, as you hear all this, you need to keep one thing in mind. Different kids are going to ask different questions, and they're also going to need really different things from us. KAMENETZ: That's exactly what I heard from Evan Nierman (ph). He's an old acquaintance of mine, actually, who moved to Parkland, Fla., a few years ago, and he lives there with his son and his daughter. His son turned 11 the day after the shooting at Marjory Stoneman Douglas High School. His daughter's 8. EVAN NIERMAN: My daughter - she wanted to talk about it. She was interested in hearing the stories of the victims. She wanted to play an active role in putting stuffed animals and flowers on the makeshift memorials and really talking it through. And my son, on the other hand - he didn't want to talk about it very much. TURNER: So give kids facts and context based on the questions they're asking or your sense of what you think they need in the moment. I mean, you know your kids best. KAMENETZ: As you're doing that, there are some more reassuring things that you can say. When we talked about the geographical thing, that didn't work so well for Evan, of course, since the event was right there in his backyard. TURNER: Right. But one thing Evan could do is remind his kids that even though this happened where they live, this kind of event, a school shooting, is very rare. And, after all, that's why it's in the news. KAMENETZ: Yeah. You know, Cory, this is something I actually talked to my daughter Lulu about when she was just 4. I don't remember what the horrifying event was that she had heard about. There's so many. But I said to her, you know, when there is stuff that happens, they put it on the news because it's unusual. And if you turn on the radio, you don't hear a report about all the little girls who are sitting in their kitchen, eating breakfast in their pajamas. TURNER: I'm going to add that to our list. I think we should report a story on a lot of little girls sitting in their kitchens, eating pancakes. KAMENETZ: I think that would be great (laughter). TURNER: Especially since Tara Conley, the media researcher - she thinks this is all really helpful for kids. Make sure they understand that the media can't talk about everything, you know? Journalists choose their stories, and some stories they just don't choose to tell. This is important. Not everybody's story gets told. CONLEY: Ask what messages are missing, what's omitted from the story. KAMENETZ: Who did they not talk to? KAMENETZ: Who are you not hearing from? CONLEY: Who are you not hearing from? And who do you want to hear from? KAMENETZ: You know, Common Sense Media, we brought up before - they did a survey of children's perceptions, and they found that 69 percent of kids thought that the news did not capture their own experiences at all for people like them. TURNER: Well, and, you know, one other thing that Tara said really struck me - that we don't just want our kids to treat media like this - it's this window we just look through. She wants kids to see the frame to help them, again, put all of this stuff into context. So that takes care of the conversation about what exactly happened. But you know, Cory, the next question we're inevitably going to get as parents is - why? TURNER: Why. And that is takeaway No. 4. When you're asked why something happened, especially something really tragic or violent, avoid easy answers and focus on the helpers. NIERMAN: Both of the kids, at various points, have asked - why did he do it? And they know his name. And they asked, you know, why did he do it? And there's obviously not a great answer for that. It's hard to explain. KAMENETZ: Evan is still struggling to answer his children's questions about why the Parkland shooting happened. TURNER: Yeah. And Rosemarie says we should resist the temptation to answer that why question by labeling people. TRUGLIO: ...Bad guys, evil guys. It's - they - there are people who do bad things. There are people who do evil things, horrific things. I don't like labeling people because I think that's overused. Maybe this person didn't get kindness and didn't get love and didn't get nurturing. So we can't figure it out all the time. NIERMAN: It doesn't explain it completely. TURNER: I mean, let's be real. Nothing can truly explain away something so awful. TRUGLIO: And sometimes, we don't have the answers to all of these whys. And it's really important for parents to say, I don't know why. I don't know why this person chose to go into a church or a school and to shoot people. I don't know why. KAMENETZ: I want to sit with this for a second, Cory. I mean, it's a really good point. It's something we talked about in the death episode. You know, grown-ups - we would love to, but we don't always have to have all the answers. TURNER: ...We pretend to have answers that just aren't good. TURNER: But Rosemarie does have a strategy here. She says no matter how dark things get, we as parents do have the ability to highlight the good. KAMENETZ: Yeah. This is the famous advice that Mr. Rogers said his mother gave him. When something scary is happening, look for the helpers. You will always find people who are helping. TURNER: Yeah. Rosemarie did this when she was talking to her son about Sandy Hook. The shooting happened on a Friday, and she says she kept Lucas away from the TV all weekend. TRUGLIO: We didn't turn on the TV until President Obama spoke. BARACK OBAMA: Because while nothing can fill the space of a lost child or a loved one, all of us can extend a hand to those in need. TRUGLIO: And there was a memorial service. So once again, we focused on the positive, how people were gathering and taking care of each other. KAMENETZ: Tara agrees with this, especially when it's an event where young people are being targeted, like a school shooting or police killing. She thinks it's empowering. CONLEY: Our natural instinct is to find those that are the antagonists in that story. But who are the ones around us that are actually helping us get through this? Who are the ones that, you know, save the lives of young people at that moment? That's where we should focus. TURNER: And there's even evidence that talking about helpers with kids really does make a difference in how they see their world. KAMENETZ: After the Columbine school shooting in 1999, Sesame did a study of children's perceptions of the world through their drawings. TRUGLIO: There was a lot of a preoccupation of death. They would have rest in - tombstones, rest in peace kind of drawings. They would have guns and knives and dead people. TURNER: But after the September 11 attacks, just two years later, Rosemarie says media coverage was different. TRUGLIO: I think the news flipped it a little bit and talked a little bit more about - the country is strong. The country's coming together. We are united. We are going to get through this. KAMENETZ: And she says that this made a real difference for kids. TRUGLIO: After 9/11, when we did the same study, they talked about heroes. They talked about helpers. KAMENETZ: You could see this, also, in the drawings that the children made - police officers, firefighters, American flags. And this shift gets us directly to our next takeaway. TURNER: Yeah. No. 5 - help kids process what's going on by encouraging them to tell their own version of the story. KAMENETZ: Children often try to make sense of what they see and hear in creative ways - through art, through play. CONLEY: They're on YouTube. They tell their own stories. They're crafting their own music, which I used to do a lot when I was a kid, as well. I didn't have YouTube, but I did have a tape recorder. And I would go upstairs and, you know, sing and be a pretend DJ. But all of that to say that, you know, the notion of play is part of reconstructing their own stories in their - and just allowing for that to happen. KAMENETZ: So we've got a pretty crazy example of this. TURNER: Yeah. It was 1995, and Natalie Van Belen (ph) and her friend Joel (ph), who lived in Connecticut at the time, were in second grade. NATALIE VAN BELEN: He'd come over to my house after school for playdates and would always want to enact the O. J. Simpson trial. I remember lots of stuffed animals on our couches - I guess to give the effect of a full courtroom. And - in retrospect, this is pretty terrible - but whenever our family's cocker spaniel would enter the room, Joel would say that that was the ghost of Nicole. KAMENETZ: Wow. I guess that's kids' imaginations for you. TURNER: Yeah. And as wild as it sounds, Tara says this is a core human adaptation. CONLEY: It also helps us make sense of the world around us, particularly when we're bombarded with information. TURNER: We adults do this, too, in a way. I mean, instead of physically acting something out or drawing a picture, we might retell new stories in conversation at the dinner table. TRUGLIO: Kids need to understand that media's constructed. Well, what does that mean? Well, you can now construct your stories. You could do a video. You can make a news story. CONLEY: And I tell them - I say, you know, hold that because at the end of the semester, you're going to create something. And remember what you're feeling right now. Remember that jolt. Remember that question. And I want you to come back to it at the end of the semester, and I want you to make something from that. TURNER: So our jobs are right in the middle of the news, Anya, but even from that position, I find the most upsetting thing about reading or watching the news is, like I said in my original story about the tornadoes, it just makes me feel powerless. KAMENETZ: Yeah, and, I mean, adults feel that way. Children feel even more powerless. That's just the nature of being a child sometimes. TURNER: So we can encourage kids to respond creatively. TURNER: Don't just talk about it. Take action. KAMENETZ: So at the beginning of this episode, we heard from Alison Aucoin about her memories and fears about the Vietnam War, stuff she just half overheard. And Alison is now a mom, and she takes a pretty different approach with her daughter. She just talks to her up front about everything in the news. AUCOIN: Like, you know, the Newtown version of gorilla versus guerilla. TURNER: Alison adopted her daughter on her own from Ethiopia, and they now live in New Orleans. EDELAWIT: My is Edelawit Aucoin, and Edelawit is spelled E-D-E-L-A-W-I-T.
KAMENETZ: Right now, Edelawit is 11. She was 7 years old when Michael Brown was killed by police in Ferguson, Mo. EDELAWIT: I just didn't know what to think. It was just - it was so scary for a lot of different people's lives. It was scary for my life, and I think when I process stuff, I just think about - oh, my God, could this happen to me? KAMENETZ: So she says then and in the years since then, whenever something like that is happening, she and her mom follow a series of steps. EDELAWIT: She always tells me about something and I always have time to process it, and then she says what I can do to help myself, to protect myself. And she always says it in that order and then we go and protest, like, a day later. And I was, like, talking to her about that, and she said she never noticed that she did that. CONLEY: In talking with our children, we also have to show them how we're helping too, and asking them, what do you - how do you see yourself as a helper in these situations? TURNER: In other words, don't just look for the helpers. Be the helpers. KAMENETZ: Or if it's a natural disaster, Rosemarie says, taking action might mean involving your child in practical planning. TRUGLIO: As a family, we need to be prepared and need to put that emergency preparedness kit together. So - at home, to be practicing fire drills. KAMENETZ: So include your kid in these preparations. TRUGLIO: Include your child in the preparations. That is key. TURNER: OK, so now it's time for a quick recap. First takeaway - keep things on a need-to-know basis. Don't leave the TV on. KAMENETZ: Maybe I will turn off NPR more often. It's hard, Cory. TURNER: I know. It goes against all my instincts. KAMENETZ: Takeaway No. 2 - when the time comes to talk with your kids about something scary in the news, pick a quiet moment and start by asking questions. CONLEY: Questions about what they're seeing, how they're feeling. What do they think - you know, who do they think the story is talking about? KAMENETZ: Takeaway No. 3 - give kids facts and context. Rosemarie says to lead with the reassuring stuff. You know, if an event's really far away, you can show them on a map or just point out that it's something really rare that's happened. TURNER: Totally. Takeaway No. 4 - when you're asked why do bad things happen, especially when people are doing the bad things, avoid easy answers and labels and focus on the helpers. TRUGLIO: Talk about how there's good in the world. There's good in your community. There are people who care about you. There are people who keep you safe. KAMENETZ: Takeaway No. 5 is encourage kids to tell their own version of a story. CONLEY: Kids need to understand that media is constructed. Well, what does that mean? Well, you can now construct your stories. You could do a video. You can make a new story. TURNER: And finally, takeaway No. 6 - when you're struggling to talk about something that's happening, don't just talk about it. Find a way to take action with your kids. KAMENETZ: And that's all for this episode of LIFE KIT for parents. Thank you so much for listening. TURNER: And, of course, Rosemary Truglio and Lizzie Fishman and all of our friends at Sesame Workshop. 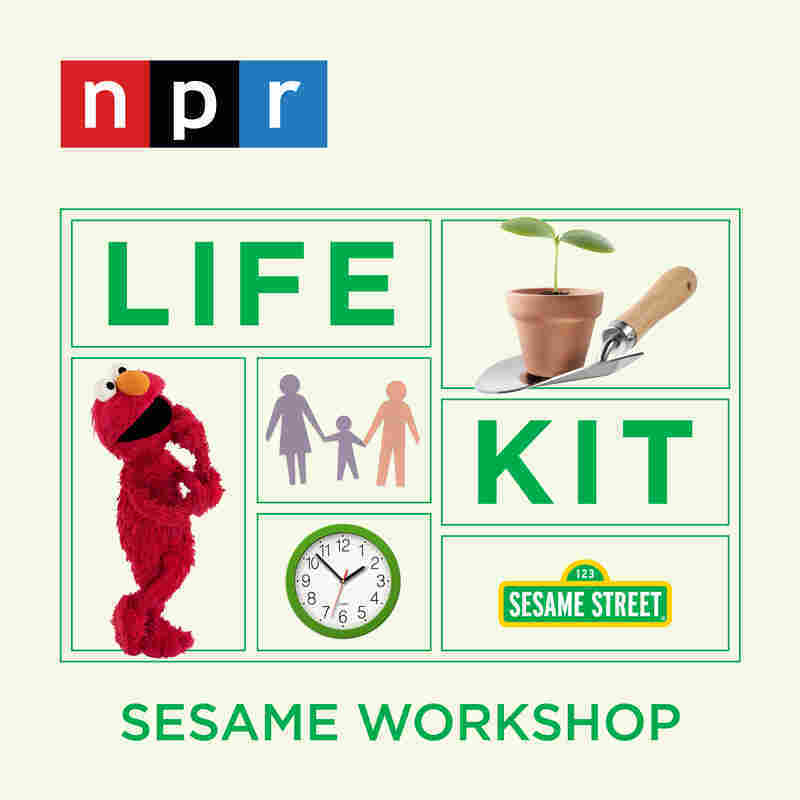 KAMENETZ: For more NPR LIFE KIT, check out our other episodes in this guide. There's one about how to talk to your kids about toys that may make you uncomfortable - think machine guns or farting ninjas. TURNER: If you like what you hear, make sure to check out our other LIFE KIT guides at npr.org/lifekit, and while you're there, subscribe to our newsletter so you don't miss anything. We've got more guides coming every month on all sorts of topics. And here, as always, is a completely random tip. KAMENETZ: This time from NPR's J.C. Howard. JC HOWARD, BYLINE: If you want to reheat pizza in the microwave without the crust getting all gross and chewy, put a glass of water in the microwave with it and it'll taste freshly baked. TURNER: If you've got a good tip or a parenting challenge you want us to explore, please let us know. Email us at lifekit@npr.org. I'm Cory Turner. KAMENETZ: And I'm Anya Kamenetz. Thanks for listening.